Amherstburg is to start its Canada Day celebrations off with its annual Canada Day 5 km run. This patriotic run starts at 9 am just outside of Fort Malden National Historic Site of Canada - the headquarters for the British forces in southwestern Upper Canada during the War of 1812 - and continues up Laird, around Toddy Jones Park, down Dalhousie and back. The course showcases the spectacular waterfront and is flat, fast and historical. Finishers will be awarded a huge unique Canada D'Eh maple leaf collectors' medal with the likeness of Sir John Alexander Macdonald, Canada's first Prime Minister, featured on it. "This medal is like nothing out there," said race director Chris Uszynski. "It is like an open-source medal, a Canadian honour that Runners get to vote on who to feature on next year's medal. It could be Commander Chris Hadfield, Rick Mercer, Sarah McLachlan, Wayne Gretzky, or Stephen Lewis. All of whom are worthy examples, but it's the runners' choice and I can't wait to see who they pick." American runners are flocking to this event to celebrate with their Canadian neighbours. The winner of the run will win their weight in maple syrup! Now that is Canadian! Runners will also receive Canadian maple leaf red and white sublimated technical running socks. After the run, runners can enjoy the ice-cream festival. A family-friendly event that includes free activities, food court, entertainment and ice cream. A fireworks display will be the finale to a spectacular day. Proceeds of the race go to benefit the Amherstburg River Lights Winter Festival. Participants are asked to raise money through online pledge forms and donations. Registration and Pricing: More information can be found online at www.runningflat.com. Get your Canadian on, Eh! To view the photo associated with this press release, please visit the following link: www.marketwire.com/library/20130606-cdmedal800.jpg. 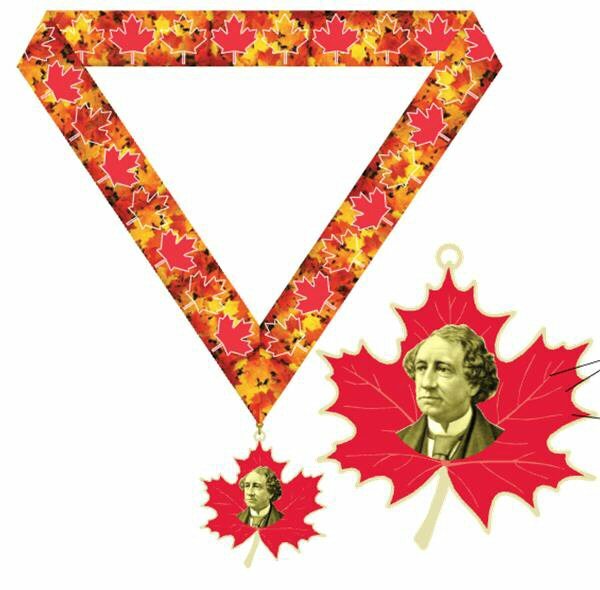 About this company RunningFlat Ltd.
Limited Edition finisher's medal given to all finishers with the first Prime Minister of Canada's likeness in the middle. Registrants vote on who will appear on next year's medal.